The three-monthly numerical. I admit that I am usually pretty CLUELESS with these, and, saying so, hand over to the other Numpty who never really enjoys them as he knows that if he makes a single error, there will be so much back-tracking to do. Spread-sheets seem to be the solving method adopted by friends but he struggles with a wad of paper, a pencil and an eraser. I couldn’t even scan the clues to check whether IOA has any desires to join the Listener Setters’ Oenophile.org. No chance! Just that set of calculator display digits to give us a model for our final submission (more later!) and, even to this Numpty, to limit the digits that we are going to use in the course of calculations as, obviously, except in row 20ac, there can be only the digits 0,1,2,5,6, 8 and 9 with, perhaps in 20ac 3 mapping to E, 4 to a lower case h and 7 to L. The symmetry requirement also ties pairs of clues and their solutions very tightly. No clue for 1ac, either – just that intriguing instruction that ‘after filling the grid, 11 of the small line segments in the top row must be erased to leave a word that is appropriate to that location’. So the other Numpty takes over: there are lists of Fibonacci numbers, but not many are needed (but was 0 included? I guessed not) so it was only 1,2, 3, 5, 8, 13, 21, 34, 55, and 89. For once Zipf’s rule was no help as we are not in “In clues letters A to Z represent numbers….”, but 1d and 10d seemed a good entry, being symmetric squares. From a Web table I found only 24 candidates ranging from 11881 to 99856, but only 69169 for 1d was 180 degree symmetric and able to form a letter, C. for 1a. Next, 7a and 19a, where the tables offered only 98596, 99225 or 99856 for 7a with a symmetric 19a. The very restricted range of letters formable from 0,1,5,6,8,9 now gives the devious solver an identification of the clueless entry at 1a, (Interestingly, if you feed those potential letters into TEA with C in the first place- not allowing the ambiguous forms of A/R and H/K- it suggests, with very little variety, that you are CLUELESS!) but more progress is quite possible without this. 6d and 16d are squares, tying 6d to 121, 196, 529, 625 or 921 but as 10a is double a square, 196 is out, tying 10a to 242 or 882. What about 5d? An ascending sequence of Fibonacci numbers? Only 1, 2, 5, 8, 21, 55, and 89 are valid options, so what about 5,8,21,55,89 with 10a as 882? Then 11a and 17a come into use: 11a has to be something such as 2911 but 17a has digits adding to a Fibonacci number so probably close to 20. Is it 21? The next good aid is the form 2n^2+1 at 8d, where there is not a big choice either now, and 20a, where 4 2-digit numbers sum to a cube, presumably between 40 and 396, so 64, 125, 216 or 343. We are faced at our CLUELESS finale with a slight ambiguity. 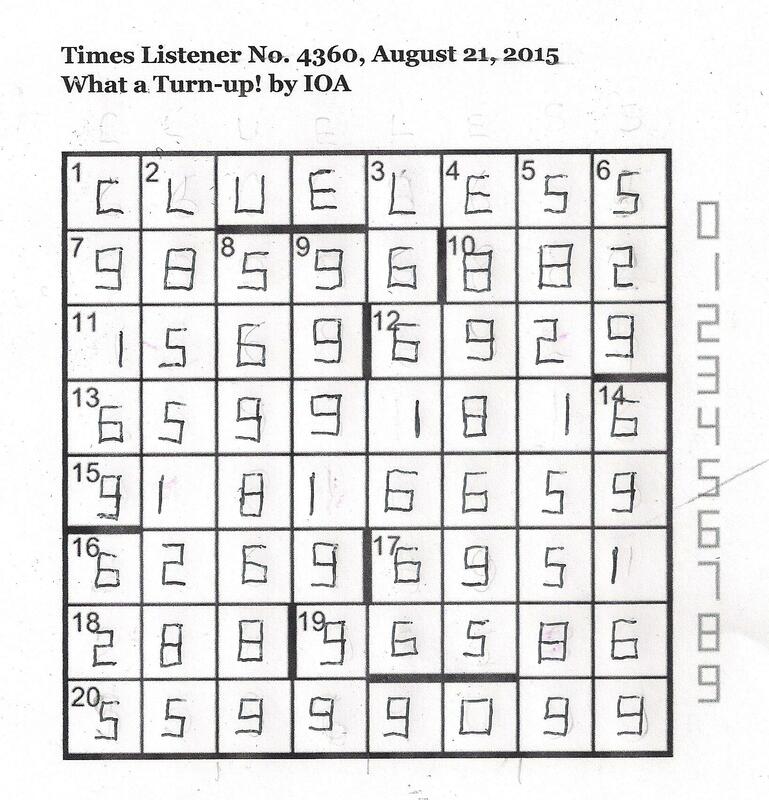 We have solved and enjoyed the crossword, and are troubled about the instruction in the preamble. A set of digits of the form appearing in calculator displays appears to the right of the grid and then we are instructed ‘Digits must be entered in that style such that the filled grid retains 180-degree symmetry’.To enter the two vertical segments that form a digital display 1, the two vertical segments must appear to the right of the cell, as in the displayed set. However, if we apply rotational symmetry to our grid, those two segments appear at the left of the cell in the lower half of the grid, not corresponding to the calculator 1. So how do we enter those 1s? Clearly a half-way measure – putting the 1 in the centre of the cell – creates 180° symmetry, but it is not a correct digital calculator display 1, as shown in the model. Thus we can see no way of fulfilling the requirements of the preamble. I would like to think that a vertical 1 anywhere in each of the six affected cells will be accepted but will it? Thank you, anyway, to IOA for a different numerical Listener that didn’t involve wads of paper and lots of back-tracking hunting for errors. We were really impressed by a numerical that used only basic mathematical functions, had an original idea as its base and an entertaining endgame that left me, at least, CLUELESS (as was, of course, 1 Across). This entry was posted on 11 September 2015 at 4:00 pm	and is filed under Solving Blogs. Tagged: Clueless. You can follow any responses to this entry through the RSS 2.0 feed. You can leave a response, or trackback from your own site. Piccadilly’s last numerical Listener Preamble Only in 2000 L3554 used the same word which had to be decoded from the leading diagonal A=1, B=2 etc. His puzzle involved palindromes that were exactly divisible by the number of digits they contained. The grid had 180 rotational symmetry but sadly not all entries were distinct which was something I know he was trying to strive for!